Common Name: Ophiopogon root, Lilyturf root, Dwarf lilyturf tuber. Part Used & Method for Pharmaceutical Preparations: The tuberous roots are dug in summer. After the fibrous roots have been removed, the roots are dried in the sun. 1. Dryness and heat in the lungs due to deficiency of yin manifested as cough with scanty and sticky sputum or cough with bloody sputum. 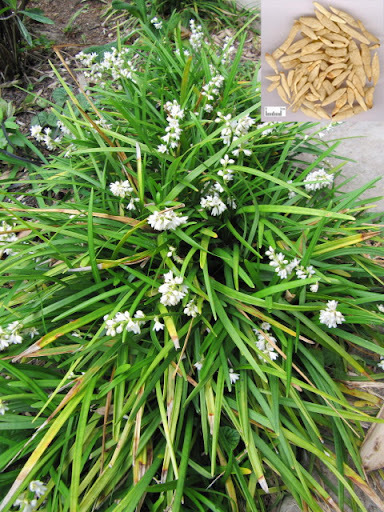 Ophiopogon root (Maidong) is used with Glehnia root (Shashen), Asparagus root (Tianmendong), Tendrilled fritillary bulb (Chuanbeimu) and Fresh rehmannia root (Shengdihuang). 2. Deficient yin of the stomach manifested as dry tongue and thirst. Ophiopogon root (Maidong) is used with Fragrant solomonseal rhizome (Yuzhu), Glehnia root (Shashen) and Fresh rehmannia root (Shengdihuang). 3. Constipation caused by dryness in the intestines. Ophiopogon root (Maidong) is used with Fresh rehmannia root (Shengdihuang) and Scrophularia (Xuanshen) in the formula Zengye Tang. 4. Irritability and insomnia; a) nutritive (ying) system invaded by pathogenic heatOphiopogon root (Maidong) is used with Fresh rehmannia root (Shengdihuang), Bamboo leaf (Zhuye) and Coptis root (Huanglian) in the formula Qingying Tang; b) heart yin deficiency with internal heat causing insomniaOphiopogon root (Maidong) is used with Fresh rehmannia root (Shengdihuang) and Wild jujube seed (Suanzaoren) in the formula Tianwang Buxin Dan. 1. Contraindicated in patients with cough due to Wind Cold or due to Phlegm and Dampness. 2. Contraindicated in patients with diarrhea due to Cold from Spleen and Stomach Deficiency.